But Peabody couldn’t escape the protests by moving its meeting to Wyoming; a group of UMW members rallied outside, and they were joined by Peabody shareholders affiliated with Powder River Basin Resource Council, Missourians Organizing for Reform and Empowerment (MORE), CO-FORCE (Coloradans for Fair Rates and Clean Energy), and Forgotten People from Black Mesa/Big Mountain in Arizona. Three activists were arrested, including one who dropped a banner that said, “Peabody Attacks: Pensions, Diné Lands, Climate,” highlighting the carbon pollution unlocked by Peabody’s coal mines, the company’s shameful treatment of retired mine workers, and the impacts of Peabody’s Black Mesa, Arizona strip mine on the health, land, and water resources of the Diné (Navajo) People. So why are costs so low at Powder River Basin mines like Peabody’s North Antelope Rochelle? 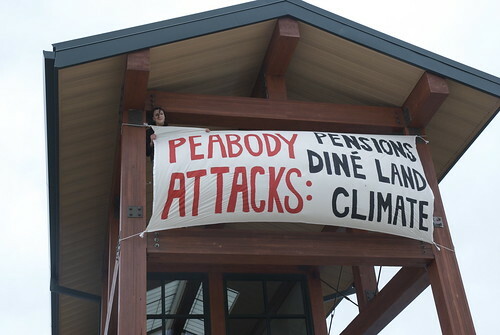 That “upside” is presumably Peabody’s desperate hope that it can stop losing money by selling more coal to Asian markets – if it can beat the broad and growing opposition to coal export proposals in the Pacific Northwest. In the “downsides” column for coal exports we might include mile-long coal trains disrupting communities and local economies, health impacts from coal dust and diesel pollution, threats to sensitive ecosystems and important fisheries, infringement on tribal rights, and enormous amounts of carbon pollution. So that’s Peabody: cheating workers out of the health care they were promised, and then dismissing their protests by declaring the matter “will be decided in bankruptcy court, not the court of public opinion.” Leasing coal owned by US taxpayers for around $1 a ton so it can strip mine it and ship it to Asia. Destroying aquifers used by Wyoming ranchers and Navajo People, and then refusing to even listen to their concerns. And all to extract coal that will end up polluting our air and water, dumping carbon pollution into our atmosphere, and acidifying our oceans. It’s not hard to see why Peabody executives would try to hide their shareholder meeting in Wyoming; “the court of public opinion” is just a threat to their business model. A more important question is how long Peabody’s operations, and those of the rest of the coal mining industry, can continue to withstand the increased public scrutiny it is facing from citizens, journalists, and elected officials. Recent front page stories in the Seattle Times and Los Angeles Times show the impacts of coal mining in Montana, and how ranchers are fighting back against the industry’s coal export proposals. The federal coal leasing program is under three federal investigations, while the list of public officials calling for a comprehensive review of coal export proposals grows longer each month. And in recent weeks, over 135,000 people have joined the call for a moratorium on federal coal leasing, following a letter sent to Interior Secretary Sally Jewell on her first day on the job by the leaders of several environmental, health, consumer rights, and community organizations. In other words, if the coal industry “require darkness” to pursue its plans for increased coal exports and leasing, let’s shine some more light.